How many of you didn’t give Valentine’s Day much thought and then suddenly got up in the morning and kicked yourselves in the….in the….yes there. I did. The kids came back home from school yesterday & went on & on about Valentines Day. Seems like Valentine’s Day is no longer just about ‘that kind of love’[and I never knew;-o], friendship is also celebrated on Valentine’s Day. So Nikita made friendship bands for her friends & Naina made cards for hers. They also wrangled 2 chocolate bars out of me, lovingly gift-wrapped it, wrote some fancy words on it and took it for their class-teachers. At first I waggled my eye-brows, then patiently supplied all the material needed for their art&craft, watched them indulgently as they talked excitedly…….and then it clicked. Ohmigosh it is Valentine’s Day tomorrow!!!!!!! Even before I started out[in my thoughts] I knew it was too late to do much. Yup, I always have chocolate with me….for emergencies u know. And the idea grew from there…. I went all around the house picking up everything red…. I’m on a roll now…..
Fished out a wooden basket from the kid’s toy bin [the original idea was to put them together in a shoe box]. Lined the basket with silver foil…..
Borrowed a red ribbon from Nikita’s accessories to tie a bow on the handle. aww..that's so sweet of you Nancy! Wow... what a great idea!!! Wow. That's so cute. Leave it like that. Uma: Sometimes we have to show[a few times] how it's done;-D.
Sulo: Dont change the topic, how did ur day go:-))???? Tharani: It's obvious AV likes to be reminded about things by you;-D.
oh wow- this is soooooo sweet!!!!! What was his reaction to your wonderful gift? I just loved it! 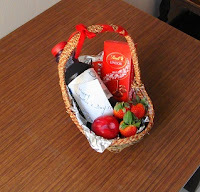 (plus loved the fact you went around finding the various items to put in the basket- rather than just going out and buying a pre made gift basket). Ramesh: Just between u & me, I think he found it a lil too girly[if u know wht I mean;-P] not that he said anything...yep got lots of hugs and more;-D.
Soemtimes I think Anita these servers are human beings in disguise, how else are they able to put a spoke on things when we have plans...esp when we have plans;-/. I am writing here for the very first time. I have been reading your blog more than a year , but never commented on any of ur post. Well , to say , Ur blog is saved in my Favourites folder..And whenever I get free time at work I read it. In many ways I could connect with you as I lived in Bangalore for 10 years , and moved to Dubai after my marriage. Well I started blogging in 2006.. But my posts are hardly 9 or 10.And when i moved my blog from rediffblogs to Blogger I lost some posts..Blame it on my hectic Job and packed weekends ... I hav'nt even done spell check or basic grammar on some of my posts. Anyways, you have inspired me a lot to start writing full on.. Soul Speaks: Awwww...thank u....thank u for the lovely comment:-)). Deepa Jose: I'm so glad you decided to comment:-)). I'm actually in a very good mood today otherwise I wd have picked up a fight with u as to why you waited so long;-D.
Also very thrilled to hear that u've decided to be more regular at blogging and that too because of me;-o. Thank U for delurking:-))!!!! wow! liked the fact that u managed to put together at last minute..ur efforts really count! pls can ur next post be abt how he liked it? my hubby believes every day should be valentines day n tries to get away with this lame excuse! will try n surprise him big time asap! The gift looks really cute :) Well done you! hope you had a good valentines day nance. that is a cute assortment of gifts! Lilac: The H appreciated my gesture....go on try it, ur H will be surprised & touched and u'll feel so good:-)). Lan: Oh yes, we all had a really good day;-D!!! Hehe Tan mushy and romantic are very OTT words after 12 yrs of marriage;-D. But dont blame u for thinking that because my gift made it seem so;-D. But seriously I believe[umm...have started believing] it is important to make the effort:-))!!! DI if u think it's all abt give & take then I'm not even going to bother asking u ur take on Valentine's day;-P. And u believe in asking questions directly huh...alright, alright I got a bottle of Lady Million & some melt-in-the-Chocolates[forgot the name], total paisa vasool huh;-D.
and when i come to office ..................???? Hi Nancy, how perfectly you managed it!! And what about the gift from your 'Hero"? I went out with friends on V-day. Was nice.